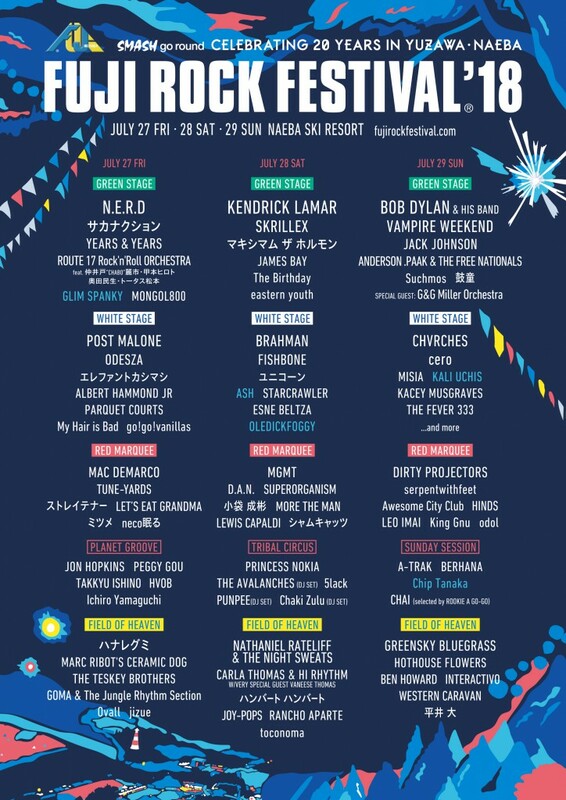 Ash, Glim Spanky, Kali Uchis And More Added To Fuji Rock Festival 2018! With just a little over a month to go before the party gets going in Naeba, the latest artist announcement for Fuji Rock Festival 2018 has arrived. Returning to the fest for the first time in three years is Northern Irish rockers Ash, gracing the White Stage on Saturday. They recently released a new album titled Islands, so get familiar with that one before you pack up your bags for the long weekend. Also playing the White Stage a little earlier in the day will be Japan’s own OLEDICKFOGGY, a previous Rookie-A-Go-Go participant. For Japanese rock duo Glim Spanky, this also isn’t their first rodeo…errr, time at Fuji Rock. But it will be their first time gracing the Green Stage, a big step up for a project that been moving up the rungs of the Japanese music industry for a bit now. To hop-scoth back to the White Stage, Sunday sees Kali Uchis play. She’s having an especially strong year, releasing the critically acclaimed album Isolation. She’ll bring songs from that set to life on the last day of the festival. Finally, for fans of video game soundtracks or just chip-assisted music in general, Chip Tanaka will play the Red Marquee at night Sunday. Real name Hirokazu Tanaka, he’s worked with Nintendo over the last few decades helping create soundtracks to games such as Tetris, Earthbound and Pokemon. He’s recently shared more original works under his alter ego, and expect to hear them on the last night of the gathering.